Pete's Best Brand Vintage Apple Crate Label. 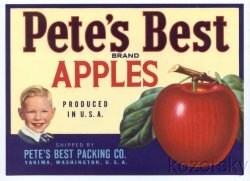 Original crate label from Pete's Best Packing Co. Yakima, Washington, U.S.A. Image of smiling blonde boy and large apple. This mint label, measures 5 3/4 inches by 8 inches. It is in excellent condition with no tears, bent corners, or creases.